Clear skies are in the forecast this weekend for the return of Sunday Streets to the Civic Center and Tenderloin neighborhoods after it was rained out last year. Families, merchants, and San Franciscans of all ages are geared up to experience the first dry afternoon of car-free space to play in on Golden Gate Avenue, Polk, Ellis, Jones, and O’Farrell streets. The route will be packed with music and activities. The Tricycle Music Fest West will bring live family-friendly rock music to the steps of the San Francisco Main Library alongside the Green Bookmobile, Tree Frog Treks, Friends of the Library, and the Roller Disco. The SF Bike Coalition’s Freedom From Training Wheels will get tots rolling along with environmental organizations at the “Green Zone” on Grove Street. At 215 Leavenworth, the Beautiful Rebels will have a Bike Wash and Cumbia dancing at Young Workers United. Boeddeker Park at Jones and Eddy Streets will feature Tai Chi, live jazz, kids’ activities, free bike rentals and a bike repair station. The Hyde Street Band will be playing some swinging rock to groove to on O’Farrell, and don’t forget to check out Tenderloin National Forest on Ellis between Leavenworth and Hyde. The San Francisco Municipal Transportation Agency has also announced that Chinatown and North Beach will get its first Sunday Streets on September 18 in addition to the September 11 event in the Western Addition and NoPa. Editor’s note: We’ll have coverage of Sunday Streets on Monday. Please share your photos and stories with us! Send to tips@sf.streetsblog.org, add your photos to our Flickr pool or send us a tweet. 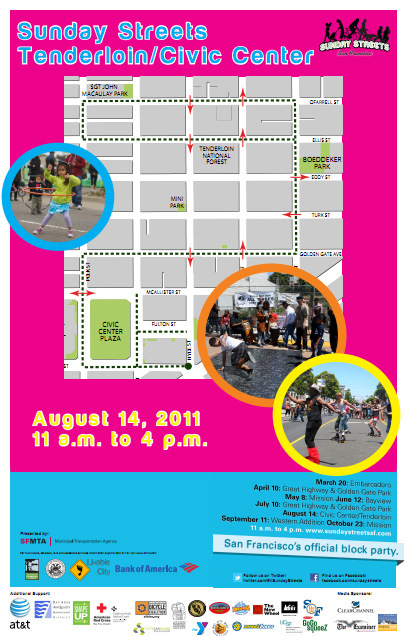 It’s been a while, but the Tenderloin and Civic Center will be graced once again with Sunday Streets this weekend. Get out and enjoy this rare opportunity to play on the normally speed-dominated streets of one of the city’s densest neighborhoods.